A cheaper option is being considered to address the congestion on the A630 Rotherham Gateway / Sheffield Parkway, a key route in the borough and city region. Work has taken place to widen exit slip roads and roundabouts at Junction 33 and Rotherham's capital strategy includes a £45m plan to widen the Parkway to three lanes between the M1 and Catcliffe. Rothbiz reported last month that Sheffield and Rotherham Councils will need to come up with local plans next year for reducing air pollution or risk the Government imposing schemes to charge users of congested roads like the Parkway. An update on the project now shows that transport officers are looking at two options on how to accommodate three lanes in each direction. 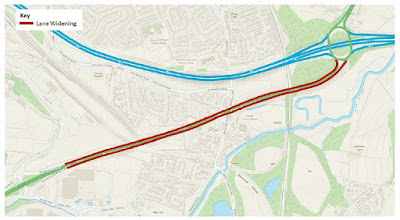 Matt Reynolds, transportation manager at Rotherham Council, said in a report: "Option 1 includes the construction of new structures to geometrically accommodate the revised highway layout. This will include compulsory purchase of land and properties as well as a number of in depth supporting impact assessments. This option is the "costed" option and is anticipated to cost in the region of £42m. "Option 2 will provide the additional lanes within existing structures, therefore reducing the uncertainty associated with third party land acquisition and construction of new infrastructure. This option will be less expensive, providing an opportunity to seek alterations to other junctions in the area. "Officers have engaged with Highways England to identify possible further improvement of the M1 Junction 33 intersection. This option will also reduce the existing national speed limit to 50mph, providing air quality improvements and delivering against the Government's recent Clean Air Zone objectives." The authority has earmarked £1m to develop the scheme and Option 2 is the Council's preferred scheme. Creating "Clean Air Zones" (CAZs) is part of the Government's plan for tackling nitrogen dioxide which includes measures to invest in road improvements to ease congestion, accelerate the uptake low-emission vehicles, retrofit technology to vehicles, promote cycling and walking and invest in bus services. Charging CAZs would place additional access restrictions on vehicles that do not meet the set standards of the zone by requiring them to pay a charge to enter. The report adds that subject to approval and completion of statutory processes, the Parkway scheme is programmed to be completed in 2021/22. The Parkway provides access to the Advanced Manufacturing Park (AMP) in Rotherham and consultants are studying connectivity around the emerging Sheffield-Rotherham Advanced Manufacturing Innovation District (AMID). The £1.4m study will seek to reduce pressure on both J33 and J34 of the M1 by exploring options to provide alternatives to the M1 for local traffic, and potentially provide additional routes between Sheffield and Rotherham without the need for drivers to pass through existing motorway junctions. The report to the Transport Advisory Board at Rotherham Council concluded that: "The A630 widening scheme will remain a priority for the Council given the strategic need to alleviate current traffic congestion and support growth at the Advanced Manufacturing Park and wider AMID. The Council is working with consultants to develop the evidence to support a preference of the two options. This will be confirmed within the submitted business case in spring 2018. "DfT require an outline business case on the AMID project by April 2018. Sheffield City Council as lead authority has appointed consultancy support to assist with the development of this business case. A series of scheme options are expected later in the year supported by high level value for money calculations."